LOS ANGELES – Defining a new era in multi-platform comedy, Conan O’Brien debuted his revamped thirty-minute late-night show and expanded Team Coco fan experience on Jan. 22. 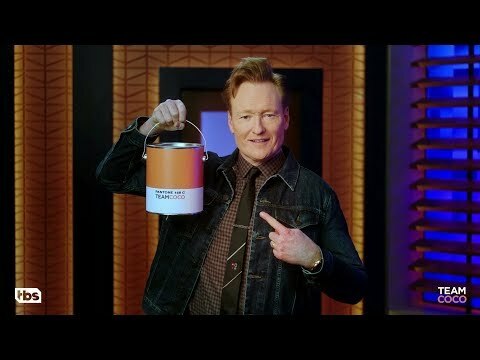 To celebrate the legacy of Conan’s illustrious television career and the expansion of the Team Coco brand, the global color experts at The Pantone Color Institute worked with Team Coco to define and create an official CONAN color: Team Coco Orange. This exclusive honor bestowed only upon such legends as Prince, Jay Z, and Barbieâ, truly indicates that Conan has reached icon status. The custom hue is based on the shade his fans have made the unique identifying characteristic of Conan’s brand. The signature color will not only be at the center of branding for Team Coco, it will represent the spirit of Conan’s comedy: energizing, fearless, warm-hearted, and animated. Starting in January, TBS will use the Team Coco Orange to paint New York City and Los Angeles in fantastic, artistic displays in each city. From now until Jan. 22, Team Coco Orange will cover more than 25,000 square feet in New York City’s West Village. The experience will live on 7th Avenue between Christopher and Barrow and will feature specially designed, vibrant art installations for fans to discover. Uniquely picturesque and Instagrammable, the takeover will lighten up the city’s grey winter days. In addition, buses in New York will get an orange upgrade. In a first of its kind in Los Angeles, a massive, fabricated billboard with more than 1000 light bulbs will illuminate downtown at The ROW DTLA touting TEAM COCO ♥ LA from Jan. 18-22. Conan’s Team Coco is a fan-centric entity that serves as the show's digital and social media hub. Team Coco is responsible for expanding the CONAN brand into additional content experiences across all screens, including digital and branded content, podcasting, mobile gaming, pay TV and live tours. Fans are invited to join #TeamCoco for a chance to win daily “orange” prizes and other perks. For more information on the fan perks program, go to TeamCoco.com/Join.